Fits a niche that is not available in the U.S.
As cyclists in the U.S. are not as savvy as those outside of U.S., or as common. Making use of every inch of a bicycle is unusual. This item fits this need , works well on both the seat post as well as the handlebar. Well constructed and tough, but at the same time light. I have placed this on the seat post to hold lights and other gear and it is working well. Have ordered one of its big brothers and expect this will be better fitting for my bag size on my handlebar. This is just what I needed to lower a handlebar bag. Light, strong and well-made. Looks like it will last a long time. Need More Things Like This! ConsDifferent clamps sizes would be nice. Had to custom make a shim to fit my 22.2mm stem. I have a 31.8mm carbon fiber bullhorn handlebar and used this Thorn Accessory bar to mount my trigger shifters on to the stem bellow it, since most shifters wont mount to a handlebar that thick. I hope these become more available to the states. The bar is to far away from the fork tube for my intended purpose. I bought ist tomount a rohloff shifting grip, and the lateral tube is too near under my race handlebar for easy turning by the hand. So I cut it off and welded it on the tube that is shifted over the fork tube. Bought to use for fitting a handlebar bag as my handlebars are not a good shape for the bag and it kept slipping. This bar is excellent, does the job perfectly, holds my bag in a good position. Small and neat and non obtrusive. Expensive for a bit of bent metal but sitting as it does on the steerer tube is far more robust than something sitting off the handlebars. My handlebars are full of stuff (more like the flight deck of the USS Enterprise). My initial use for this thing is to mount a light, but I will undoubtedly find a use for the remaining space! Purchased to mount our big bar bag from Arkel. We were unable to mount the bag on our moustache handlebars on the front of our tandem. This device solved the problem! I had to order it from the UK as I could not locate a vendor in the US. Received in within 2 weeks, much to my surprise. ConsMy barbag is just a little harder to access when pedalling along. Proskeeps my bar bag away from the cables. Keeps the handlebars uncluttered. Bought to carry my Ortlieb barbag. I previously used a Minoura Swinggrip which eventually fell apart. The advantage of this device is that it keeps your bars clear and uncluttered. It also places the bar bag further away from the brake and gear cables. Using the Ortlieb mounting bracket on my handlebars, the bar bag had a tendency to kink the cables thereby affecting performance of the gears. It doesn't become a nuisance like the swingbar when upending the bike for maintenance or get knocked and damaged like a swingbar. The downside is that the bar bag is just a little further away for access on the move. My grip shifter fits on a 21mm bar will it fit on this? I've a grip shifter on a 21(ish) mm flat bar and I'm hoping it'll fit on this. What's the diameter of the "stick"? Also what diameter will the clamp fit on? As advertised the extension bar is 22.2mm in diameter, and the steerer tube clamp fits 1.1/8th inch steerer tubes. Can I mount this (or a similar product) to my seat post for the use of 2 rear lights? I have a large rear mudguard & saddle bag which both obscure any lights which have been previously fitted to my seat post. I am looking for a product like this which would allow me to mount 2 lights to my seat post (1 either side of my mudguard & saddle bag) so that they are not obscured & visible to traffic behind me. 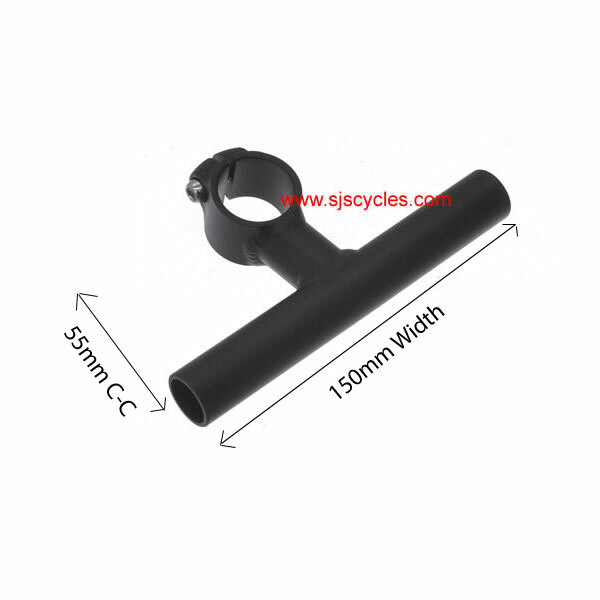 Yes this could be fitted to a seatpost, as long as the size is 28.5mm or less. Please, Does This Accessory T-Bar Include End-Caps? It Is A Bit Hard To Tell From The Photo. Thanks. This accessory bar does have end caps. Do You Have A Shim To Use This Bar With A 22.2Mm Quill? We don't have a shim that will cover the full distance from 22.2mm up to 28.6 for this accessory bar. We could offer two shims, but this may limit how well it can grip the stem and it may be able to move. Is This Strong Enough To Mount A Bar Bag On? Yes this Accessory T Bar should be more than strong enough to hold the weight of a bar bag. Thorn Accessory Bar T Shaped 55 Mm Ext + Canti Brakes? Am thinking about getting one of these to fit a shifter for a hub gear with drop bars. Will this interfere with cantilver brakes and the front cable hanger? It is possible it will interfere with the brakes or front cable hanger. But this all depends on where you have it mounted and what position you mount it in, without knowing how you have your bike set up with spacers ETC I can't say for definite if it will work or not I'm afraid.